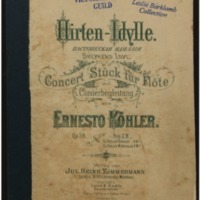 Hirten-Idylle für Flöte mit Klavier-Begleitung, op. 58 / Ernesto Köhler ; edited by Dr. Theod. Baker of New York. For flute and piano. Copyright 1891 by Lyon & Healy.